Bonn, 7th of November 2017. At the beginning of the climate conference climate activists of the Ende Gelände alliance shut down the Hambach lignite mine. An immediate coal phase-out is necessary and possible ­­- this is the message of the successful action of civil disobedience. Around 3000 persons jointly entered the mine and stopped several diggers as well as the conveyor belt. In this way, they expressed their demand for climate justice. At yesterday’s action, Ende Gelände scandalized the government’s failure to act. Many international activists participated in the action. In course of a ceremony of the climate justice movement the Pacific Climate Warriors handed over four enormous petals on which was written: “STOP FOSSIL FUELS NOW!”. 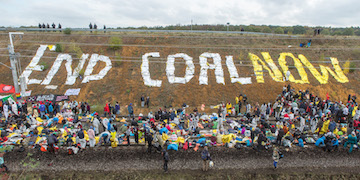 At the margins of the lignite mine they publicly declared their solidarity: “It hurts to see this massive coal mine because we know what it’s doing to us in the Pacific. This is exactly what we’re fighting against. It gives us hope that so many people are coming together here to put an end to the era of fossil fuels”, states Brianna Fruean, Climate Warrior from Samoa. Simultaneously the alliance reaches out to local problems and to networking on site. Many residents participated in the opening demonstration. Others supported the action by offering sleeping places and premises in Bonn and the region. “The actions demonstrate our determination to stand up for preserving the climate and against company interests. Civil disobedience allows us to head off the destruction with our own bodies. For us, this is the first step into another world. One which does not subject to a capitalist logic of utilization but is oriented towards people’s needs”, explains Ende Gelände’s spokesperson Dorothee Häußermann. At the beginning of the actions the police initially acted in a de-escalative manner. The activists succeeded in flowing through the police lines and to descend into the pit. The alliance strongly criticizes police activities inside the mine. “The police used pepper spray and batons against singing activists, a cavalry division rode into groups of people, whereby persons were injured by hooves. These activities were absolutely inadequate and resulted in many, partly heavy injuries”, criticizes spokesperson Dorothee Häußermann. In the run op of the climate summit Ende Gelände demonstrates how climate protection works in practice. After the action climate protectors all over the world will continue the protest in various ways.